Wasting energy seems ridiculous – check out this hilarious 1 minute poublic television campaign from Powersmart Canada (approx 2015). Energy saving takes planning, prioritising, engaging and review (just like the plan, do, check, act cycle). You’ll often see a hierarchy of prioritising energy management investment – see diagram at right. As you can see from the hierarchy, energy saving includes both energy efficiency and energy conservation (plus generation if you can afford it). Energy conservation is reducing or going without a service to save energy (eg turning off air-conditioning in winter). In contract, examples of energy efficiency is about using less energy to provide the same service (for example, through efficient appliances and thermally efficient air-tight building design with appropriate ventilation). Whether you’re a householder, company or community enterprise, there are plenty of resources and organisations out there to help maximise your savings such as the Association of Building Sustainability Assessors (ABSA) and the Energy Efficiency Council. A basic free handbook with case studies is: ‘From Shop Floor to Top Floor: Best Business Practices in Energy Efficiency’ prepared by William R. Prindle, ICF International, for the Pew Center on Global Climate Change, April 2010. It’s available in pdf download (176 pages) from the Center for Climate and Energy Solutions. The UK’s Carbon Trust also has a series of resources on energy management. There many resources in Australia. The NSW Government’s Department of the Environment has a guide to energy saving action plan and training resources under ‘Sustainable Business’. 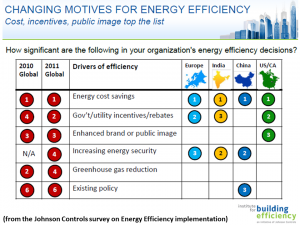 Why business has been slow to take up energy efficiency and energy saving? In 2012, the Australian Broadcasting Commission (ABC) produced two ‘Background Briefing’ programs on energy efficiency – one focused on the home and the other on the shortcomings of Australia’s policy efforts so far. In late 2012 there has been a rush of energy efficiency initiatives rolled out by the Australian Government however there are many gaps in energy efficiency policy. To keep up to date with changing energy efficiency policy in Australia, you can refer to the Australian Governments own websites including EEX (with resources and news) and pages from the website of the Department for Resources, Energy and Tourism. For independent comment from non-profit organisations check out: the Energy Efficiency Council, the Alternative Technology Association and/or the work of Alan Pears of RMIT. Each year, an international survey is conducted to gauge attitudes, priorities and concerns of people at the front lines of energy management in commercial buildings throughout the world. Check out the website for the energy efficiency indicator managed by Johnson Controls here. Measuring and monitoring is a key part of this process if you’re looking to achieve a strong payback period. The payback period in years is calculated by dividing the total capital cost of an initiative, divided by net annual savings for the first four years after the initial investment (not including the initial investment costs). You can include both energy and non-energy quantifiable costs and benefits. No discounting of future costs and benefits is done when calculating a simple payback period. You may wish to calculate return on investment (ROI). The ROI is equal to the net project benefits divided by the costs and multiplied by 100. Another useful calculation is the Internal Rate of Return (IRR). The IRR method “determines the interest rate necessary to make the present value of the cash flow equal to zero. This represents the maximum rate of interest that could be paid if all project funds were borrowed and the organisation was required to break even on the project.” (Quote from The Green Scorecard: measuring the return on investment in sustainability initiatives by P.P. and J.J. Phillips, 2011, page 213). You may also wish to reduce lifetime costs and maximise different types of value. The Energy Efficiency Toolkit for Buildings from the World Business Council for Sustainable Development. The American Association for Energy Engineers recommends the Handbook of Energy Audits by Thuman, Niehus and Younger – it’s part of their course reading list. Sustainability Victoria’s resource efficiency tools for business here. Saving energy can often be assisted by drawing on nationally recognised rating tools such as NABERS (the National Australian Built Environment Rating), NatHERs (applicable to housing) and other more comprehensive tools from the Green Building Council of Australia. There is an internationally recognised quality standard for energy management (ISO 50001) and other Australian Standards relating to energy audits and related topics. A small number of Certified Measurement and Verification Professionals (CMVP) in Australia. the Energy Efficiency Council has started to train more M&V professionals in Australia in 2012. A best practice guide to M&V (2004) is available here and the most recent version of the Protocol (v3 2008) is available here. A new standard for energy audits is due for release shortly (following consultation in mid 2013). Find a qualified energy auditor who has completed the CMVP training here. The Building Code of Australia has a number of provisions relating to energy efficiency, mainly in Section J, outlined in various handbooks here. For an overview of energy efficiency in the code, check out the Australian Building Codes Board here. The NSW Government has developed a suite of energy efficiency training resources for different building categories and industry sectors here. In addition, some training is being rolled out in the Energy Audit Standards AS/NZS 3598.1:2014 and 3598.2:2014. To gain competency in conducting a sustainable energy audit, locate a registered training organisation here. Australia is likely to introduce accreditation for those individuals and organisations such as energy service companies (ESCOs), who conduct energy audits and implement energy performance contracts (EPC). Australia’s Energy Efficiency Council and Sustainability Victoria have been involved in progressing this work being lead by the Ministerial Council on Energy through the National Framework for Energy Efficiency. The work built on the Prime Minister’s Task Group for Energy Efficiency (among other things, the final report includes chapters on the role ESCOs and the prospect of adopting a national white certificate scheme to provide incentives). Stay tuned! In the past, the Australian Government’s Energy Efficiency Opportunities (EEO) program provided formal support to large energy-using businesses for improved energy efficiency. Although the legislation has been repealed, you can still access case studies which have been transferred from the EEO website to the EEX website here. The Commercial Buildings Disclosure (CBD) program has been another mandatory program in Australia to encourage eco-efficiency by requiring commercial buildings over a certain size to disclose building performance to prospective owners and leessees. It is being reviewed by the Australian Government. Further videos are available from Manufacturing Skills Australia such as the following 14 minute entitled Measuring and Calculating Energy Efficiency.